The Panasonic DMC-FS3 is another addition to Panasonic's compact FX-Series of digital cameras. Like the newly announced Panasonic DMC-FS20, DMC-FS5 and DMC-LS80, it has a new image processing LSI and Venus Engine IV. The Panasonic DMC-FS3 features the new 2.5 inch intelligent LCD, which means that the LCD can detect the lighting conditions of your environment and appropriately adjusts the level of brightness so you can see your subjects clearly. The Panasonic DMC-FS3 also boasts of an intelligent auto mode which allows users to take optimal pictures without having to adjust the settings manually, this is perfect for those who don't know anything about photography but just want to take good pictures during family gatherings or special occasions. Panasonic's Intelligent Auto Mode includes their Mega Optical Image Stabilization to compensate for any hand shake, minimizing the chances of any blurry image. The Panasonic DMC-FS3 also includes the intelligent ISO and Intelligent scene selector plus Panasonic's Face Detection technology can detect 15 faces on the frame even if your subjects are moving. Other noteworthy features of the Panasonic DMC-FS3 includes a title edit function, 8.1 effective mega pixels, 50MB internal memory and video recording at 30 frames per second at 16:9 aspect ratio. The title edit function on the Panasonic DMC-FS3 will allow you to enter text to accompany a picture like entering the name of a memorable travel destination or the names of your subject. 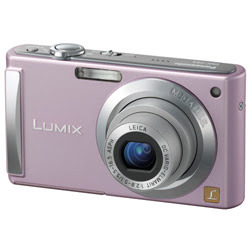 The Panasonic DMC-FS3 will be available in blue, pink silver, green, and black and will be available this February for a price of $199.95.